There are six legitimate contenders to win the league and another one or two could fight their way into the precious top four spots. The FA and Capital One Cups should be equally fascinating with the requisite upsets from the lower tiers and England's heavy-hitters trying desperately to get through it all. For Arsenal fans, no season will represent any kind of step without a trophy of some kind. Even as each of the four competitions grow more difficult each year, the expectation to win them swells just the same. The entertainment level of these dramatic competitions is right there with them. Last season, it was Wigan and Bradford making runs in the Cups, the three-way fight for third and fourth place in the Premier League and Bayern Munich and Borussia Dortmund steamrolling the world on their way to an unforgettable Champions League final. Within the Premier League specifically, the weekend's results, paired with the additions of the league's best clubs, made it even harder to nail down any favorites. Spurs spent more than $100 million and lost to Arsenal before Özil was even a Gunner. A Luis Suarez-less Liverpool knocked off a United team that looks lost without its long-time steward. Chelsea looks terrifying and Manchester City has the same potential. Before the start of the season, the looming transfer rumors around all of the Premier League's best made it fairly impossible to nail down a legitimate favorite. Jose Mourinho was back. Alex Ferguson was gone. Arsene Wenger still hadn't spent any money. Tottenham bought the world to offset a potential sale of Bale. Some of those remain true through three weeks of matches and the merciful end of Silly Season. Even more has happened in this first month that further shook the league to its core. It's impossible to know where teams will finish in any season. 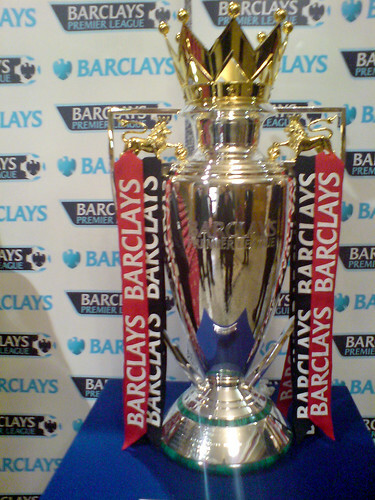 This year's edition of the Premier League, though, may bring that to a whole new level. Aston Villa: Aston Villa pulled off one of the better pieces of business on Monday, swiping Czech striker Libor Kozak from Lazio for about £7m. He led the Europa League in scoring last season, so he'll be well versed in torching Tottenham and Chelsea. Cardiff City: Cardiff's only goal come Monday morning was to keep Swansea from landing Peter Odemwingie. The Bluebirds managed to do this, picking up the Nigerian from West Brom. I'll admit I think that rivalry is a cool addition to the EPL, but Odemwingie strikes me as an odd person to fight over -- because he's bad. Chelsea: Jose Mourinho refused to loan Demba Ba to Arsenal because he didn't want to give his a rival a new weapon. Ba's stuck in purgatory, more or less, but it doesn't matter as long as Roman Abramovich gets his way. Seriously, what a shitheel. Crystal Palace: Word is, Arsenal was willing to pay Nicklas Bendtner £3 million to leave with Crystal Palace keen to sign the Danish egomaniac. None of this happened, but the hypothetical arguments between Ian Holloway and Bendtner were worth the rumor. Everton: Marouane Fellaini handed in a transfer request shortly before the window ended to reunite with David Moyes in Manchester. Dead to me. Fulham: Fulham's boss Martin Jol fought tooth and nail to get Stephen Ireland, but lost out to Stoke City. Losing to Stoke and Newcastle in one weekend should be enough to get any manager fired. Hull City: People in Hull are under the impression that the club just needs a better finisher. They lost, 2-0, to Manchester City on Saturday and missed an opportunity to sign Shane Long on Monday. But hey, at least the fanboys covering them awarded them a moral victory. Liverpool: Luis Suarez is really, really, really staying at Liverpool. He just doesn't understand why everyone think he's going to leave as soon as he can like he has -- or tried to do -- every other time he's played anywhere. Manchester City: Joe Hart is pretty bad now for some reason. Manchester United: Signing Fellaini is a good move for Moyes, obviously, but the best move of the week was Wayne Rooney cutting his head. He'll miss a few weeks, but at least it saved Moyes from selling him. Newcastle United: Joe Kinnear is an idiot, and it's hilarious. Norwich City: Nathan Redmond's mom told him that good things will happen if he worked hard. He believed her, and she was right. Moms, man, they're the best. Stoke City: Stoke signed a player once hailed as the "Next Ibrahimovic." He and Jermaine Pennant should enjoy talking about wasting talent together. Southampton: Southampton dropped points to Norwich City on Saturday. Soton spent £36 million this summer. Losing matches to other clubs likely in that relegation battle probably isn't a good idea. Sunderland: Sunderland picked up Fabio Borini on loan and Andrea Dossena on Monday. It really doesn't matter. Sunderland is terrible. Swansea City: Alvaro Vazquez moved from Getafe to Swansea on Monday. It's unlikely, but I'm terrified this is just Michu Volume 2. West Brom: West Brom tried to bring Romelu Lukaku back on another loan from Chelsea, but the move failed. Lukaku landed with Everton. West Ham: Stewart Downing is out for at least three weeks with a leg injury. Between injuries and transfers, the Hammers are just killing it right now. Something something Liverpool is a feeder club for Sunderland, at least in terms of crappy players. Let us also not forget that United had to pay MORE than Fellaini's release clause because they left it too late.